All I can say is WOW! The Full Moon Total Lunar Eclipse in Leo is still six days away and already the Queen of Swords is showing her face. We will talk about the Full Moon in a moment, but first let’s talk about Mars. Today, Mars, the planet of action, is at the anaretic degree of its home sign, Scorpio. On its own, I do not think Mars can be much more intense. The Queen of Swords is a take-no-prisoners kind of Queen, and she is very serious when it comes to her goals, much like Mars at the very last degree, especially in such an extreme sign. Do your best today to put this very aggressive energy to use in a positive manner. Focus on organizing important projects and making things happen toward your changes. Do not allow this energy to put you in an argumentative mood. Ok, so the Full Moon. 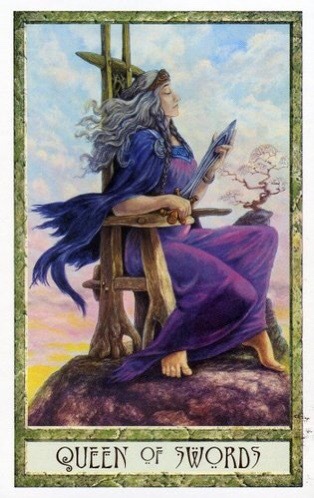 There is so much hype with this one, and the Queen of Swords loves to hang around at the time of a Full Moon. With her comes a caution to curb your tongue, even when speaking your truth. At the very least, think before you speak, for, during eclipse season, endings which come about as a result of of ill-spoken words become permanent, and “I am sorry” will simply not cut it. This entry was posted in Card of the Day, General Tarot, Love and Finance, Patreon, Readings, YouTube Videos and tagged Card of the Day, Guidance, Path, Queen of Swords, Reading, Tarot.